A few months back, conscious of evaporating youth, a cranky hip, a whingeing knee and a recently outraged ankle, fleeing Slieve Lamagan, it struck me that teaching what I know as a time-served challenge walker, rather than struggling to practise it, might make more sense. I flagged this up on mviews and a few hopefuls took up the challenge, all of whom I think have benefitted and some who now themselves inhabit the outer fringes of the challenge zone and are becoming increasingly impressive. In this spirit, the sleek, scarily quick and new mviews member msmurty, press ganged me into acquainting her with the annual Mournes 7x7s Challenge. 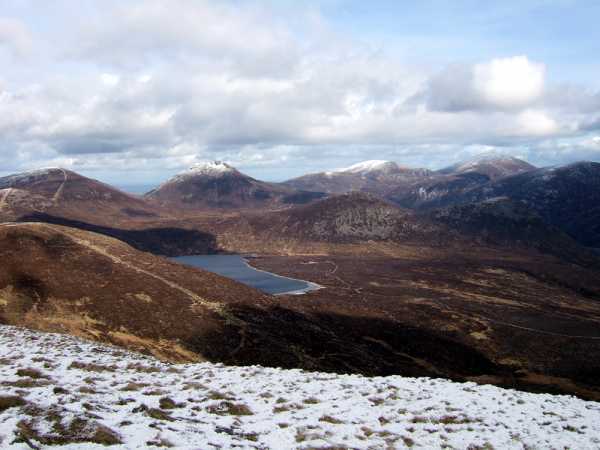 Views vary on this Challenge Walk but there is consensus that it might be the toughest in Ireland. 7 hills of over 700 ms in one August day with a merciless trail across bleak bog for good measure. Anything under 9 hours is to be admired. No sooner than I had suggested the reply “maybe”, than La Murty had a 6 months training schedule compiled and a pen in my hand to sign it, kicking off yesterday with 5 of the magnificent 7. If ever teacher was taught a lesson, here it was: complacency, laziness and a loosening grip on the task, compounded by the pace of a jet-fuelled companion meant that on No5, challenge evangelist Bleck Cra was running on fresh air alone. Not one teaspoonful of ascending gas left in the tank and an almost tearful desire to be home, dry and still. On a crepuscular return to Donard Car park, the Cra soaked to the bones and busted, Murty says to him “Sure that was great…” Oul boy challenge walkers take note: if you want to do the talk, first make sure you can do the walk.